“The American (college) campus has become an interesting place for a conservative.” –Dinesh D’Souza. I will officially be done with college next month and in my four years of college I can certainly agree with D’Souza’s statement. It was interesting to be on a college campus during 2008 when you were a complete fool and ignorant voter if you did not support Barack Obama and his radical liberalism. It was also interesting to have my college commencement be used as a platform for Al Gore to push his global warming agenda on my graduating class. Some people, especially students, can easily get discouraged and even sometimes feel the need to become apologetic about being a conservative. I am a conservative because I believe that conservatism represents American values such as; limited government, individual rights, and many more. These are the values our country was founded upon and I believe it is important that we continue to fight for them. 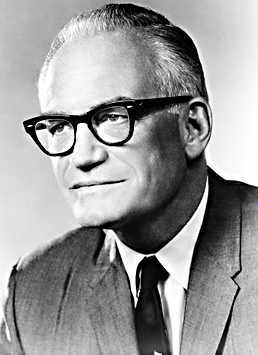 In 1960 Barry Goldwater (pictured above) felt similar sentiments when writing The Conscience of a Conservative, “I have been much concerned that so many people today with conservative instincts feel compelled to apologize for them.” It is extremely important that conservatives do the opposite of apologizing for their beliefs. Conservatives should stand up to the values they believe in because these values are embedded in America. And as Goldwater went on to write, “Thus, for the American Conservative, there is no difficulty in identifying the day’s overriding political challenge: it is to preserve and extend freedom.” I believe these words still ring true today and we should continue fighting for this nation that has so blessed us with her freedom.